There are so many reasons why you should want to find questions to ask your kids. 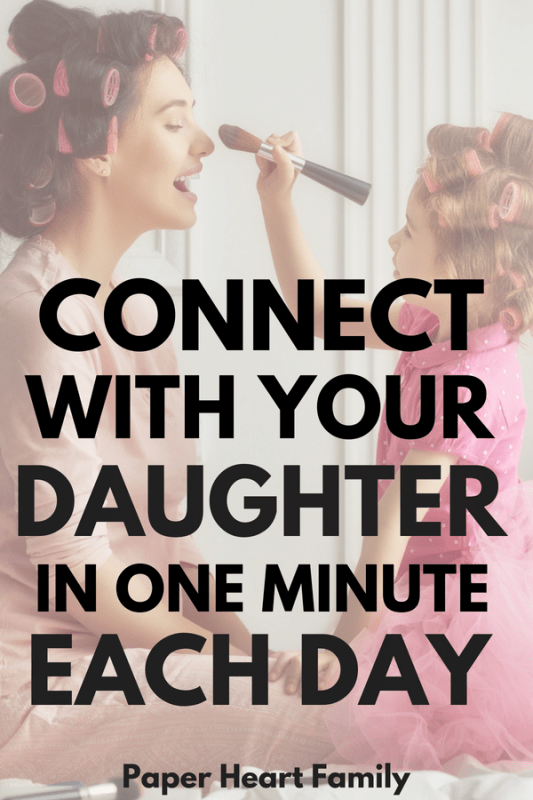 These questions are the perfect way to open up communication between you and your daughter. 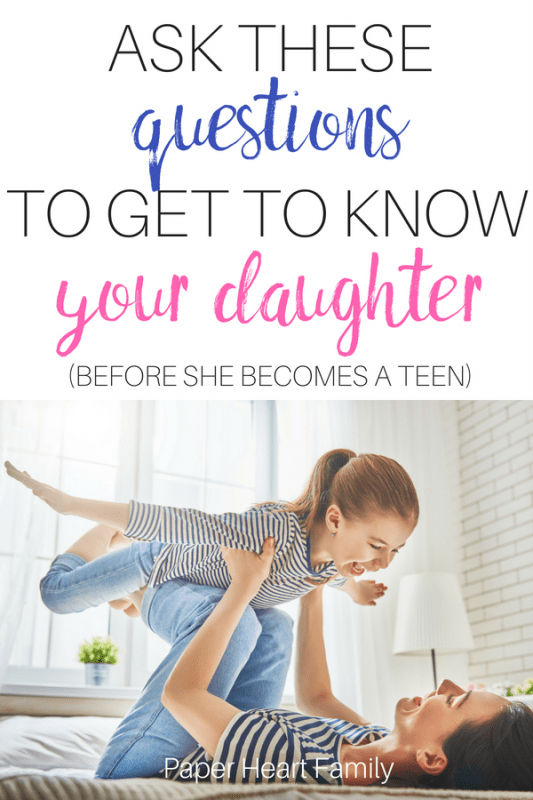 You might want to ask your daughter these questions to get a glimpse inside her mind, to look at your child’s world through her eyes. Maybe you want to make sure that you take time each day out of your busy schedule to give her some one-on-one attention. Or maybe it’s because you fear the teenage years. A completely legitimate reason to want to bond with your daughter NOW. Also, as much as making time for my kids is a priority for me, sometimes life gets busy. When we complete our question of the day, it forces me to slow down and forget about everything else for a couple minutes. And I am deathly afraid of the teenage years. I need my daughter to learn NOW that she can talk to me. That I WANT to hear her thoughts and dreams, her worries and her problems. Even though these questions can be completed quickly each day, many of them can provide a chance to talk about issues your child is facing, or a chance to start a conversation about the importance of being kind or confident. I love these questions because there are fun, laugh inducing questions mixed in with serious, more thought provoking questions. This means that you will able to discuss topics that are important without your child realizing that you are talking about serious stuff. Because oftentimes when we talk about things like believing in ourselves or being compassionate, we come off as if we are lecturing our kids. 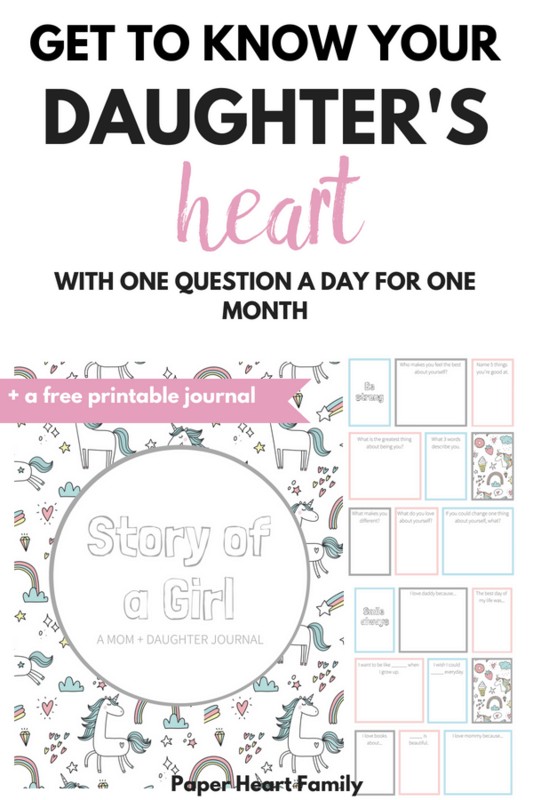 Be sure to check out my printable below as well, so that you can print these questions and record your daughter’s answers. Each week of questions revolves around a different theme. I wish I could _______________________ everyday. I want to be like _______________________ when I grow up. Who makes you feel the best about yourself? Why? Name 5 things you’re good at. If you could change one thing about yourself, what? What did you do today that was nice? What do you do when you see someone who needs help? What do you love about your sibling? How does being nice make you feel? Would you rather not be able to taste anything or feel anything? Would you rather fly to the moon or be invisible? Would you rather find a treasure map or magic beans? Would you rather live in a shoe or a tree? Would you rather have 100 brothers or 100 pets? Would you rather build a tower or knock it down? Would you rather slide down a rainbow or jump on a cloud? 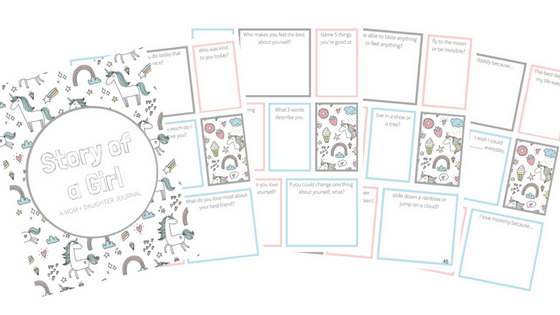 I’ve created a printable keepsake with these questions, so that you can record your child’s answers. This is fantastic! I know my daughters would absolutely cherish this time together. Thanks so much for creating this resource! I’m glad you love it, Sara! My daughter definitely loves it, and I love learning more about her too! I don’t have kids, but this looks like a great journal! I love this! My mom and I did something similar when I was younger and I loved it. Such a great way to keep the lines of communication open in a fun way. That’s awesome about you and your mom! I would have loved to have some something like this with my mom ? My daughter LOVES reading and writing – I think we are going to have to try this. I hope you do and I would love to hear about it! What a great idea! I love the routine and that you can look back on their answers later on in life! Thanks Ashley! I love looking back on written memories like this. This is so sweet and such a good idea. It makes your child learn some valuable critical thinking skills because they have to evaluate the question. These types of questions will help them academically, but also problem solve. Plus, you get to bond! I love it! Thanks Brittany! You’re right, it definitely does get my daughter used to answering questions about herself. What a cool idea! I can’t wait until my kiddos are just a little bit older—will definitely be doing this with them! Yay! I’m glad you like it, and hope you come back! I love this so much! So creative and a great idea. Awesome for creating time together and memories. Hi! I absolutely love this idea! I’ve subscribed, but can’t figure out how to get these printouts from there. Help? 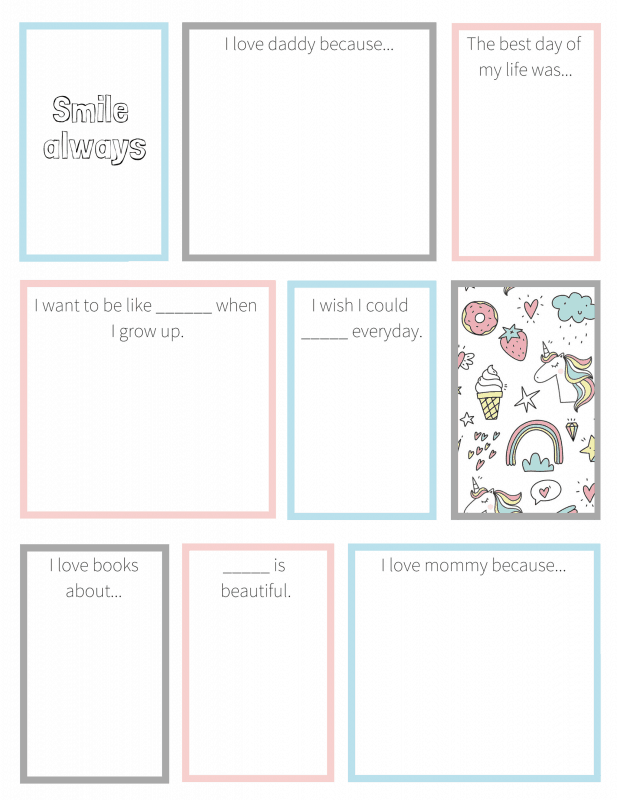 You should receive an email with the link and password to my entire printable library. You can email me at [email protected] if you’re still having issues. I hope you love the journal! Thank you so much, Neve! I love this. My daughter is 9 and we already use a shared journal. I agree that I want to do everything I can now before she hits those teenage years for her to know she is special and I will always be here for her! I’m so glad you liked the post. I’m a teacher of middle school students, so it’s very much on my mind everyday that I need to connect and build bonds NOW. I’m so glad you like it! I hope you’re using this list of conversation starters with your daughter!